Am still not sure about that big plaster figure of the Black Prince on the frontage of the house. At the time of gluing, I thought the building might be being used by wool merchants – possibly a Guild House/Hall or something. 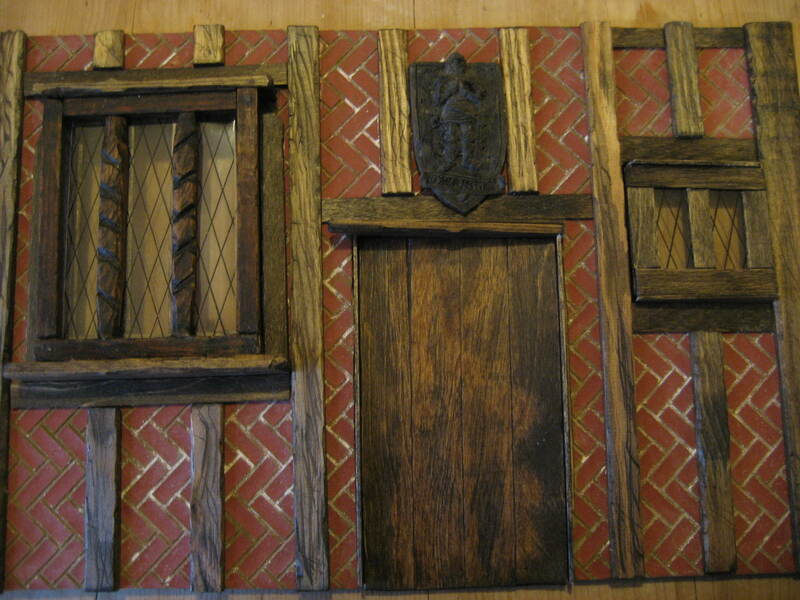 Since then, because of what I wanted to do with the interior generally, it seems to have moved on to whatever merchants were part of the Hanseatic League – or something like the later Merchant Adventurers possibly. When trying to get a grip on this, I came across an interesting page about the Hanseatic League in Kings Lynn – don’t know if you’re interested in that area, but take a gander if history is your thing? Everything in the setting has become much looser and leans more towards a total fantasy, based very freely on various historical factoids and what gubbins I would like to use to decorate the establishment. I fancy something around merchants who deal in the Mediterranean, Levant and further east – spice trade and all that. There’s enough rope there to hang with, I think. I soon realised I needed a base for the room boxes to be built upon. So I kidnapped an old table top hoarded from an even older caravan we once had. It’s proved very useful as, not only was it then the right size for the boxes (yes I’m just lengthening it even as we speak) but it also fitted through the doorways in our house. That at least would mean that I could get it out of the door to the dump for disposal, should the need arise. I then placed it on one of the bits of furniture we couldn’t part with at an earlier period of life “cos it would come in useful someday”. We’d had a high level bunk bed in the house years ago and it had a table on castors that lived underneath it. This table now forms the movable, swivelable base to the whole model. I added another pull handle at the opposite side to the existing and so far so good. After making the frontage and hiding it, I decided to work on the hallway that would fit behind it. This was to contain an office of sorts – for some sort of clerk. What I’ve ended up with looks more like some sort of modern take on a Tudor hotel booking office but it catches the theme of the building, I fear. The hanging document bars and shelves are an idea taken from the painting of Georg Gisze. The picture is full of symbolism but taken at face value provides detail and ideas for things that can be made to add interest to the area – am planning to have a go. The main thing about the hallway was going to be the stairs. Yes, I’d read all the ‘how to’ blogs and instruction websites about attaching the banister etc and felt fully forewarned about the fiddliness. Laugh! Where do I start! I must have glued, cleaned again and re-glued that damned thing 4-5 times before I felt safe to attach the whole to the wall! I still hesitate to breathe on it! On the walls of this area and in the office space I decided to stencil some motif or other and used water crayon pencils onto the rough painted walls. Quite pleased with the look of these, if a little rough and ready. I reckon the owners had the decoration done by a ‘local’ as a cheapy. Some of the floor is floorboarded to go with the stair, but the strip of entry is quarry tile and the office flooring is stone slab. I know, it’s a v small area. My excuse was that I was investigating ‘how to’ with each different medium. 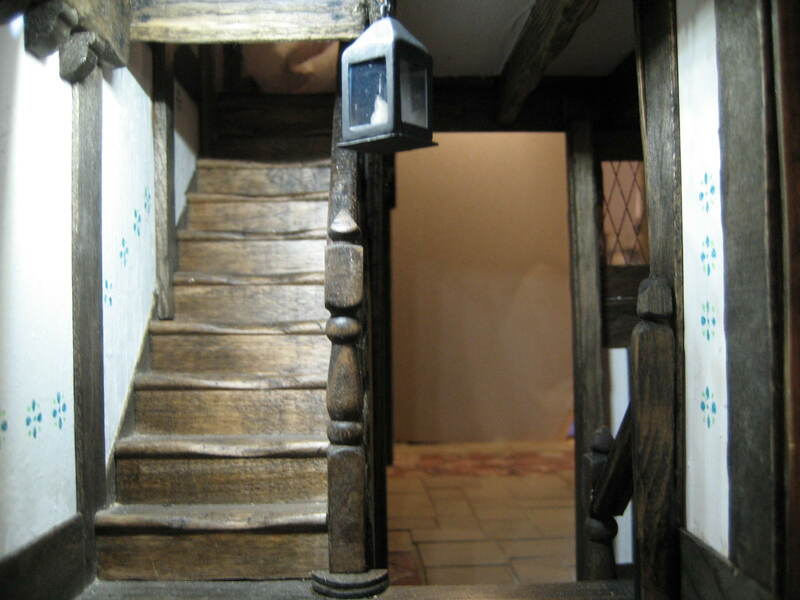 The hanging lamps are by Ashwood Design Miniatures. Hallway half landing - I spent hours wearing the treads down - you'd think a person would do something better with their time wouldn't you? I’m quite captivated by your project, the stairs were worth the fiddling about with, they are stunning! I love the ‘wear’ on the treads.